An economical & lightweight tablet PC floor stand. 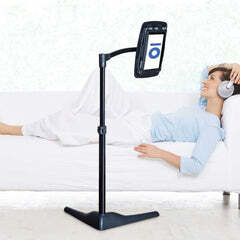 This sturdy & reliable tablet PC stand works with any tablet, and features a strong, stable base. The innovative LEVO frame is engineered to reduce movement while you surf the web in comfort. This stand is a step up from our G2 Essential model, and features an added USB charger built into the stand. Charge your device while you surf; hands-free! For ultimate stability, this LEVO tablet stand features a 20 lb. base that provides exceptional security for your favorite tablet PC. This LEVO stand features an adjustable base that allows use of a device up to 8lb by simply adding sand to the base. This exclusive LEVO tablet stand also features dual lightening USB charging, so you'll never run out of power for your device. Our highest extension - great for use with chairs, sofas, recliners and even in bed! Our longest reach for compatibility with all your favorite furniture. Best platform positioning. Plus, it folds away (without moving its base) making it ideal for easy adjustment and relocation. Best platform positioning. Plus,it folds away (without moving its base) making it ideal for easy adjustment and relocation. Height is adjusted with quick lever locks (like most tripods). Swing arm moves freely, but includes adjustable tension dials. No Yes. 1 USB port. High-grade wiring to maximize output. Uses your device transformer. No Yes. 2 USB ports. 1 in base (1.0 amps) and 1 near Platform (2.1 amps). High-grade wiring to maximize output. Includes 3 amp transformer. For an economical lightweight tablet floor stand, it doesn’t tip over very easily unless force is applied. Its frame is specially engineered to reduce bouncing and swaying while you surf. For ultimate stability its 20 pound base provides exceptional security for your tablet. If you have small children or dogs, this is a great option. The base on this tablet floor stand is adjustable. For most people, its current weight of 10 pounds is perfect and allows the stand to hold up to 4 pounds before tipping. It's very sturdy, however, If you want to hold up to 8 pounds, you can simply add sand to the hidden tank.